Black Sheep on 2nd Street opened in August of 2013. We’ve been there a handful of times before realizing they were open for Sunday brunch. Maybe it was the large amounts of wine mixed with Poutine. Mostly, yes, that’s the reason. Our friends recently told us they love going to Black Sheep on Sundays just to get brunch. They have a smaller menu but every single thing on it sounds delicious. They even have a Mystery Waffle… uhm hum. Let me say that again… a Mystery Waffle. How cool! Anyway, word on the street is their Bloody Mary is “a-okay”. Naturally, I had to try. Mix: Black Sheep has something great going on and it doesn’t stop with the Bloody Mary. I thought the mix was awesome. It had good consistency, it was spicy (but not too much), and it had great flavoring. I got the “spicy” mix but it didn’t take me as being spicy. Maybe I’ll ask for extra spicy next time. It was a great, classic Bloody. Very good! 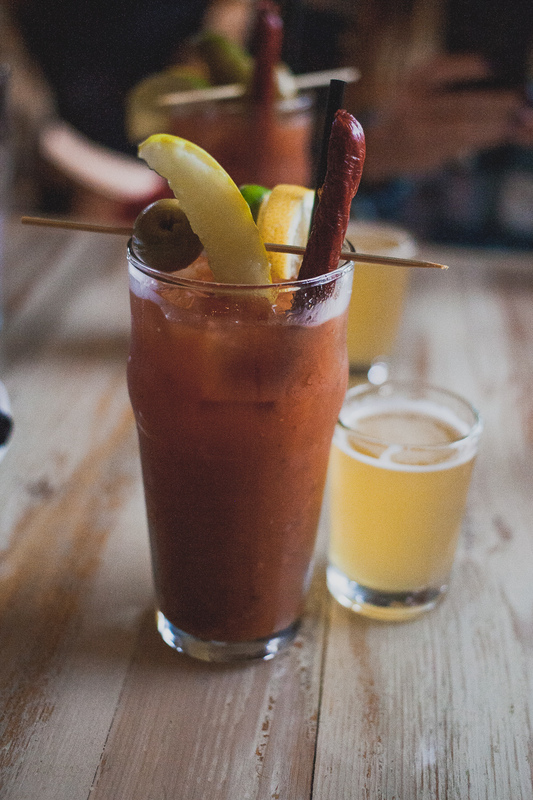 Garnish: When our friend told us about Black Sheep’s Bloody Mary, he said they had a beef stick straw (how cool). However, the Bloody was served with a normal straw and an above normal beef stick (seriously, it was so good. I even bargained with my friend a pickle/beef stick swap). On the menu, they offer to add a Raw Oyster for an additional $3. Sadly, they didn’t have Oysters during our visit. Hopefully next time; fingers crossed! This was actually served with a large pickle spear, a green olive, beef stick, lemon and lime. Pretty standard. The mix didn’t need to hide though so I appreciate the garnish! Chaser: I’m not sure what this was served with a chaser but I’m not sure what it was. Sorry chaser lovers. Buzz: I caught a miniature buzz before eating the awesome Breakfast Skillet. It quickly diminished after something got in my belly. Cost: $8. With the raw oyster, this would have been $11. I feel like both options would be worth it. My final thought? Go check it out. If you’re not one for Bloody Marys, at least go for the wine. Um, it’s on tap, hello. The food at Black Sheep has also been consistently great. I hear they have the best gourmet hot dogs during happy hour. Let’s just say I will be back. This entry was posted on December 27, 2014 by Shannon in Bloody Marys in the area and tagged beef stick, Black Sheep, Black Sheep Brunch, Bloody, Bloody Mary in Milwaukee, Milwaukee, Milwaukee Bloody Mary, Oyster, restaurants, Sunday Brunch, Third Ward, Walkers Point.